Creating a fitting groove to a song is what bass guitarists do most often. It’s also the most complex accompaniment technique and could fill an entire book. But, since you don’t have time for that, check out these quick tips. All you have to do is choose the style of the groove and decide whether to make your groove bold or blending. 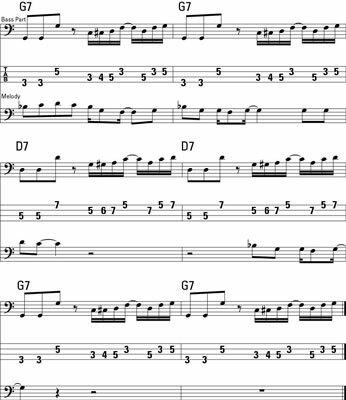 Playing grooves works best when the song doesn’t have a lot of fast-moving chord changes. You can exploit a groove most effectively when staying on one chord for a while. 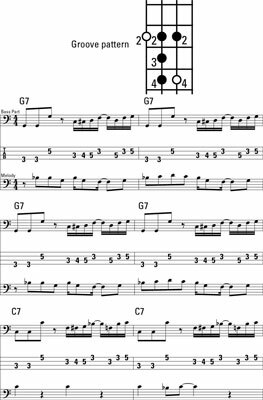 Make sure your groove stays fairly consistent throughout the song and that all the chords relate to each other…in a groovy fashion. Check out this song that uses one groove that moves with the changing chords. Play along with the song and come up with your own.